LET’S ADDRESS WHAT some might consider the morally inconsistent status of an all-electric luxury SUV costing $135,400. By design, the Tesla Model X P90D Ludicrous (that’s the real name, apparently) is meant to be green and efficient—and well-to-wheel, net-to-net, EVs are way cleaner than gas-powered cars. Electric vehicles are a technical expression of our belief that the atmosphere is the blue commons, owned by all. Egalitarian in impulse, in other words. But the Model X is also the rarest sushi of materialism, class privilege under a blister of tinted glass, a suede-lined pachinko parlor of the soul. Just remember as you pull up to Nobu in West Hollywood and supermodels come running out to the valet to take a picture with your Model X with the doors up: You’re saving the planet. Here’s the hard part for most people: It can be both. A feature of a free society is that some have more than others; such are the risks and rewards of capitalism. This is a given. This is gravity. But everyone, no matter their lifestyles, can consume less. And, by the power of numbers, a lot of lesses add up to quite a lot. So some Hollywood celebrity downsizes to a Gulfstream IV and now she’s Mother Earth? Well, yes. Consider it a self-imposed carbon flat tax. F. Scott Fitzgerald said the test of a first-rate intelligence is the ability to hold two opposed ideas in mind at the same time and still function. 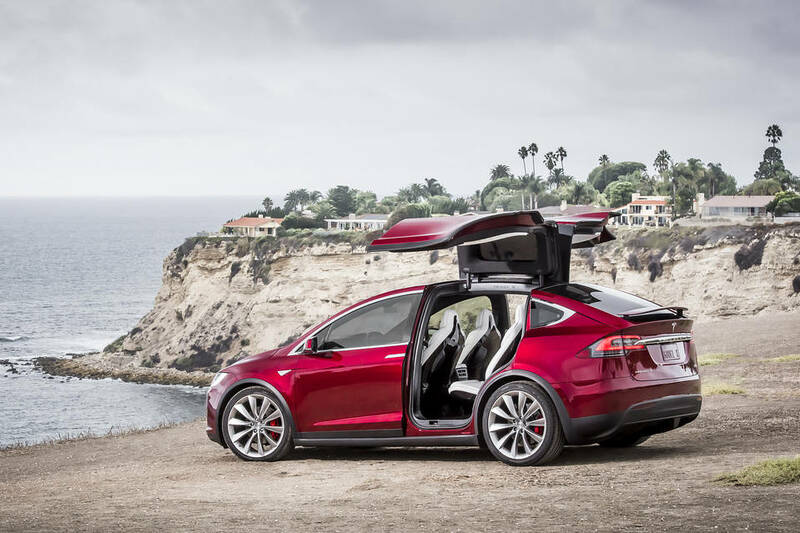 It also seems to apply to the Model X’s famous Falcon Wing Doors, since they are simultaneously unnecessary and absolutely vital to the entire enterprise; deeply thought-through yet completely spurious; impractical and…well, more impractical. But you get used to them, because they are so cool. See above re: supermodels. Or retired aerospace engineers. Or French tourists. Or the hard-core, mainlining petrolheads who kept me waiting in the parking lot at Venice Beach, Calif., while they selfied themselves, laughing madly, sitting in mid-row seats while the doors were up. When all the doors are open you can look through the Model X as if it were a picture window with a Tesla-shaped sill and sash. Would minivan-style doors have been a more sensible technical solution to a mid-row door opening? Infinitely. You could have done the doors off the Dubonnet Xenia easier that the Model X. But the spell these doors cast—let’s call it emotional engineering—is payoff for some of the shrewdest design money ever spent. Powertrain: all-electric all-wheel system comprising dual three-phase, four-pole AC induction motors; liquid-cooled lithium-ion battery pack (90kWh nominal); on-board charger and supercharger enabled; permanent all-wheel drive. A bit of context: The Falcon Wing Doors came about because Tesla CEO Elon Musk liked them and wanted them, full stop. He has said he didn’t want the production car to be a dialed-back version of the concept car, which is just the sort of initiative and forward thinking that gets people cashiered from General Motors. To aficionados, Mr. Musk’s move smacked of pride since in over a century of automotive design, from the Mercedes-Benz 300SL Gullwing to the DeLoreans to Lambos, gullwing doors have always looked cool and never really worked. To name a few of the problems: ease of entry and exit, weather sealing and wind noise. From a safety standpoint, center-hinged overhead doors cut into the kind of rectangular geometry around a door opening that lends it rigidity. What if it snows overnight? What if it’s raining? Where do you put the ski racks and bicycles and the Thule roof module full of hiking gear? Who cares? Have you seen the doors open? Most maddening was creating a dead-stable pivot point for the doors, which rise and fall slowly on the motorized breeze not like falcon wings but more like seagull wings, with a double fold. The solution required a heroic amount of costly magnesium in the car’s dorsal spine. 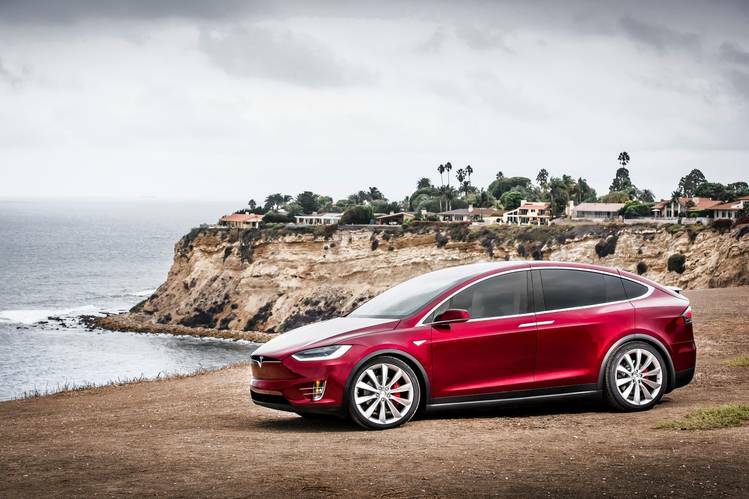 Mr. Musk has copped to overreach with the Model X. Maybe he tried to do too much, what with the Model X’s sensor-rich Autopilot driver aids; the dancing shuttle-craft seats; the HEPA air filtration system with the “Bioweapon Defense Mode” setting; the panoramic windscreen, a stunning soap bubble of a canopy over your head. Dude, you’re forgiven. But then again, I’m not a stockholder. Practicality for fascination. This is the card Mr. Musk continues to play to his advantage. This is the part of the Tesla business plan that might as well have been quoted out of the Old Testament. The rich will want the riches. Not to be confused with the Model 3 compact sedan that debuted so boffo this week, the Model X is a full-size SUV with dual electric motors front and rear, providing all-wheel drive. Although its body structure is almost entirely aluminum and magnesium, our flagship test car (P90D Ludicrous) was quoting a massive 5,381 pounds, most of it in the floor-mounted battery pack. Four-corner air suspension with five ride-height settings, from off-road to highway, is standard. The Model X is a luxury family mover, with five-, six- or seven-passenger seating options, with a rear trunk and a frunk (a front trunk). The deeply tinted glass canopy creates a pretty magical space, although (another old lesson, relearned) the California sun is too bright through the roof glass. I understand additional tinting is available. The front and mid-row seats are mounted on powered pedestals that glide forward as if to a Strauss waltz, easing access to the third row’s two cozy bucket seats. The seats’ pedestal mountings allow passengers more foot room than otherwise. All the doors open electrically, which can take some getting used to. If you get in and put your right foot on the brake, the driver’s door will swing closed, even if you have not yet retrieved your left leg. The door will gently gnaw on it until you take your foot off the brake. The price for the “standard” Model X 70S with a 70kWh battery is $80,000, which is about $5,000 more than a base Model S—a fact that is academic because Tesla won’t be building any base Model X’s for some time. 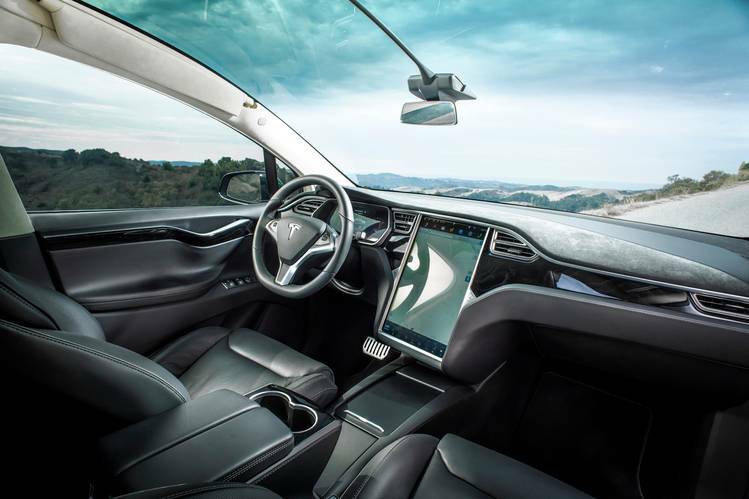 The company will instead be filling orders for the flagship P90D (“P” for performance). These will come with a face-flapping 713 pound-feet of insta-torque from two huge four-pole AC induction motors ($35,000) and the famous “Ludicrous” Drive Mode ($10,000), which essentially permits the battery to violently eject electrons in pursuit of maximum acceleration. In Ludicrous Mode, the Model X P90D max output is 532 hp. That’s the version that Tesla provided me, and I want them to know, I’m on to their game. It is very hard to find fault with a six-seat SUV that accelerates like a Formula Atlantic open-wheeler. Jeebus. Stamp the accelerator and it goes off like a sprung mousetrap. Tesla estimates 0-60 mph in a Lambo-like 3.2 seconds. While doing so, the Model X quietly withdraws everything from your pockets and scatters it conveniently under the back seats. Around the City of Angels, the sweet, effortless blurt of our EV hot-rod tempted me to do, well, questionable things. No yellow light ever turns red for the Model X P90D. No hole that opens up in traffic is ever too small or far away. Falcon wings? Maybe Icarus. But if the Model X flies too close to the sun, there’s always more window tint. Dieser Eintrag wurde veröffentlicht in e-mobility und getaggt mit Elon Musk, ModelX, Tesla am 9. April 2016 von innovation.